She doesn’t want to hear that, and decides to leave Philadelphia and try for success elsewhere. On the way out of the building, however, she sees her gangster boyfriend murder a man in his mob. Deloris flees to the police station to seek protection and to tell officers what she has seen. The police have had mobster Curtis Jackson on their radar, and are eager to keep Deloris under their protection until she can appear as a witness against him. The policeman assigned to protect the singer is Eddie Souther. Curiously, Eddie and Deloris were in school together and Eddie had a huge crush on the glamorous singer now under his protection. Evidently as a young man, Eddie would perspire excessively when around attractive girls, and received the nickname “Sweaty Eddie.” To add further insult to his deflated ego, he is on some sort of probation in the police department and is currently not allowed to carry a gun. Eddie accompanies Deloris to a local religious convent, under direction of the Mother Superior who reluctantly accepts protective responsibility for the woman in hiding. 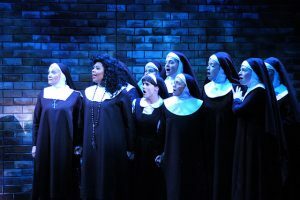 All of this is told in the first few minutes of “Sister Act” now delightful on the Arvada Center Stage. The cast is flawless. And large. Performances are so good however, that it appears the entire production is an “ensemble” review instead of casting spotlight only on lead performers. Brit West dazzles as Deloris Van Cartier. Keith L. Hatten is appropriately menacing as the mob boss, Curtis Jackson. David Kaverman is believable as police officer Eddie Souther, and MeganVan DeHey is spot-on as the conflicted Mother Superior. Stephen Day turns up as Monsignor O’Hara in his tenth performance at Arvada. Aaron Fried, Anthony Alfaro and Napoleon M. Douglas are a delight as what remains of Curtis Jackson’s mob. Their show-stopping tale in Act II is one of the evening’s delights. The convent nuns are in a special class by themselves. They run the age gamut from very young to very old, with each given a chance to shine. Among those shining brightly is Emma Martin who begins the show as an incredibly shy and awkward novice, and under the tutelage of Deloris, turns out to someone to be reckoned with. Megan Van Dey Hey (Mother Superior), Brit West (Deloris), Emma Martin (Mary Robert), Kitty Skillman Hilsabeck (Mary Lazarus) and ensemble. Deloris can’t hide in her convent room pretending to be a nun forever, and is given responsibility of leading the nun’s choir. She steps up the tempo, much to the delight of the nuns, as well as of the local congregation. The new music isn’t what Mother Superior wants to hear, but the Monsignor is delighted. Church-goers find renewed interest in services where the nun’s choir sings such joyful music. The Church’s finances improve, as Deloris has the nuns singing and dancing. The nuns are a blast! As mobster Curtis Jackson has already killed someone early in the show, there is always a fear that other mayhem may ensue. This keeps the show interesting, as a back-up to the terrific music and dancing. “Sister Act” first turned up as a movie in 1992. In 2009 a musical production in London’s West End opened to great acclaim, and a Broadway adaptation opened in New York in 2011. Music is by Alan Menken, with lyrics by Glen Slater. Rod A. Lansberry, in his 23rd year at the Arvada Center, has hit yet another “home run” as the show’s director. Wonderful chorography is by Kitty Skillman Hilsabeck who also turns up as one of the convent nuns. The mob will be chasing the police’s star witness in the convent through October 2 at the Arvada Center.